The MBUS Pro (Magpul Back-Up Sights) are a corrosion resistant all-steel back-up sighting solution that delivers maximum functionality and strength with minimum bulk at a price that's even smaller than its size. Case hardened and finished with Melonite QPQ for extreme resistance to wear and corrosion. Mounts on any MIL-STD-1913 Picatinny/STANAG 4694 rail including receiver-height gas blocks. Elevation adjustment knob - no tools required. Positive detents in both the up and down positions as well as on the elevation knob. 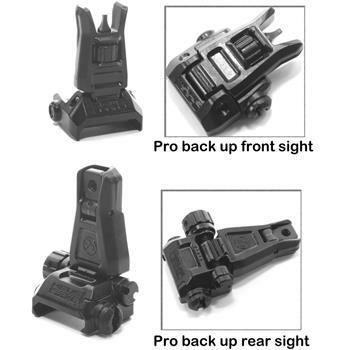 Standard AR sight height when deployed. Height above rail, stowed: ~0.43" max.